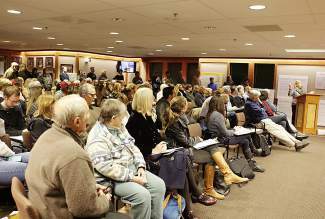 Truckee Town Hall was packed with residents Monday evening. Roughly 300 people were in attendance at the meetingâs first day in town council chambers and 3 spillover rooms. 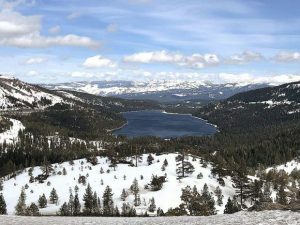 TRUCKEE, Calif. — The Truckee Planning Commission opted Tuesday night to delay a decision on the controversial multi-acre Canyon Springs development proposed near the Glenshire subdivision. Commissioners voted 5-0 to adjourn Tuesday’s meeting to a special meeting on Dec. 1, when the group will reconvene to begin deliberation. The commission’s ruling came after a roughly 5-hour public meeting at Truckee Town Hall, where several facets and criticisms of the development’s final environmental impact report were discussed in detail. The vote also came after a 4-hour public hearing the night before in front of the commission, which saw roughly 300 people in attendance packed in the town council chambers and spillover rooms. At Monday’s hearing, 68 people offered public comment, as well as representatives of environmental groups Mountain Area Preservation and SOS Glenshire. Of all public comments, two people spoke in favor of the development. According to commentary from town staff and commissioners before adjourning Tuesday night, the special meeting on Dec. 1 will be a continuation of this week’s meeting, meaning no additional public comment will be taken. Instead, commissioners are expected to discuss and debate the project, and they could vote to approve or not approve it. Or, the commission could direct staff to work with the EIR’s consultants to make changes to the report, in time for a final review and vote at the commission’s Dec. 15 regular meeting. 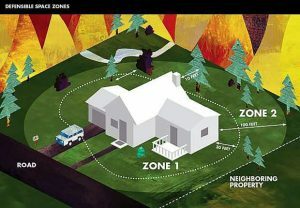 Look for a full story and recap of comments later this week at SierraSun.com.